The Average guy took on the role of the Average mechanic this weekend and learned about Shimano vs SRAM setup. 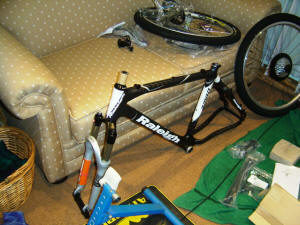 The arrival of my new Raleigh RM 8.0 Carbon hard tail on Friday led to a 48 hour bike building fest. Having had a small set-back after my appendectomy, I am once again not able to ride. So, all you loyal MTB Online readers will have to wait a while longer for a review on the new carbon hard tail. In the meantime, I had a very interesting weekend playing bike mechanic, bike mechanic. 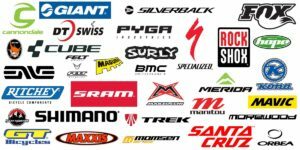 I’d like to share my Shimano vs SRAM experience with all of you from a bike build perspective. All the above parts would be built onto a new Raleigh RDS 7.0 frame for my good wife. I would keep the new Rock Shox Reba and the LX front derailleur for the hard tail and build my XTR components from my ageing RDS 9.0 onto the hard tail. This project provided a good opportunity to compare the ease of set up between the two component manufacturers. Basically a SRAM equipped bike for my wife – and a rebuild of the Shimano parts for me. Before we get into the nitty gritty of the build, let me just say how blown away I was at Raleigh’s attention to detail on the new bike. I received the RM 8.0 in 2 boxes. 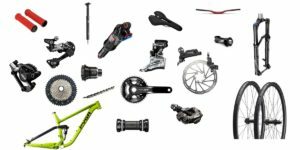 Every single tiny part is somehow Raleigh branded: The super light foam grips, the seat post collar, the Jagwire outer cables and even the carbon headset spacer were Raleigh branded. When put together, it just looks brilliant! I’ll just focus on the component setup to draw a fair comparison between Shimano vs SRAM setup. The Avid Juicy 5 brakes came pre-bled. They also have post disc mount adaptors that allow you to connect them to international standard disc mounts. This adds weigh to the package but man! They are super easy to set up and align. This is the second time I have built up a bike with juicy fives and both times it has taken 5 minutes per wheel to get the discs aligned perfectly. The Shimano XTR is less easy. Both front and back callipers have international standard mounts. This means you better have stacks of disc spacer washers and stacks of patience! Luckily for me, the front brake was easy to align as I was taking it off an existing bike so I just used the same spacers and it worked perfectly. The back was somewhat more of a mission. I would say that it took about a half hour to get the back aligned and not rubbing. And even now as the bike stands, the back is not perfect, it will take a few rides for the alignment to settle in. Both the SRAM X-9 derailleur and the Shimano XTR were equally easy to attach and align. The High and Low setting screws are possible slightly easier to get to on the X-9 derailleur. But I had them both on and the inner and outer limits set in 5 minutes. 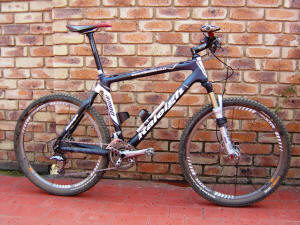 Both setups had Shimano front derailleurs. All I can say here is that the spacer and sticker on a new front derailleur are really handy to get the set up spot on. Don’t take them off until you have it on the bike and aligned. The SRAM chain is really easy to get on. With the power link, it takes about 30 seconds. The Shimano pin system is, well, let’s just say, less easy! I didn’t have to put the cable into the X-7 shifters, but it looks like a mission. There is a cover that must be removed and to do this one would have to move the brakes out of the way. The XTR Dual Control has one screw that removes a cover and the cable can easily be threaded through. I’ve replaced cables a gazillion times, so I’m really good at it already! For both systems it was quite quick to tension the cable and then index the shifting. I was really impressed with the SRAM shifting, it’s very smooth although I don’t find the thumb shifting very intuitive. Obviously, the parts are all brand new so the chain sails across the cassette and the feeling at the lever is very light. Having said that ,my XTR equipment has a new lease on life. I finally had to ditch my Nokon cables as after 2 Cape Epics and 18 months of service they looked a little worse for wear and weren’t really going to look great on my new carbon beauty. So, back to XTR cables for the new hard tail. This turned out to be a great choice as I now realize that my trusty dual control shifters are not at all finished after their 18 months of hard work. I was suspecting them of reaching the end of their life, but the new cables have shown that they are still as perfect and smooth as when they were new! I’m really shocked that my very old Nokon cables were making the shifters feel like they needed retiring. I now think there are still many miles of good shifting in the DC shifters. There was no real difference for me getting the rear shifting right on the 2 systems. 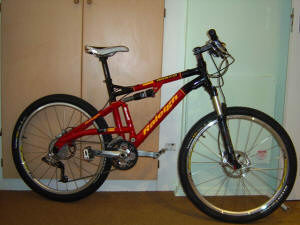 Even with the XTR being rapid rise and the X-9 standard they were both easy to get set up. Once again, both bikes were Shimano. I just always struggle a bit with front shifting, but am getting better at it all the time. I was just very nervous tightening the front derailleur onto the carbon seat tube. I hope I have it tight enough! Well there it is! I am not going to proclaim one system better than the other. There are definitely things that are better or worse, but they all balance out. At the end of the day the bikes took me the same amount of time to get set up. What I can tell you with all certainty is that it was great fun! If you have not yet entered the world of being your own mechanic, buy a bike stand and get stuck in. I consider working on my bike a hobby. And you’ll get better and better at it. Besides, it’s not a combustion engine!